FOUNTAIN VALLEY, Calif., Nov. 6, 2018 — The Pedego® Scottsdale, Pedego® McDowell Mountain and Pedego® Glendale electric bike stores will host the Pedego Palooza Scottsdale event on Sunday, Nov. 18, 2018. Beginning at Noon, the event includes a 10-mile guided Pedego electric bike parade group ride along the Scottsdale Waterfront followed by a party at the Brat Haus in Old Town Scottsdale. It is free to owners of Pedego electric bikes and open to the public for $25 per person with Pedego electric bike rentals available at an additional cost. Pedego Electric Bikes is the Number 1 electric bike brand in the United States. Pedego electric bike riders delight in the beauty of Scottsdale’s scenic paths. On the 10-mile guided electric bike parade group ride, riders will visit the city’s renowned Canal Convergence presented by Scottsdale Public Art, enjoying art installations along the ride. From there, the ride will continue north on the canal for a scenic tour to Pima Road. Returning to the Scottsdale Greenbelt, participants will ride south to the Scottsdale Civic Center and Old Town for a hosted party at the Brat Haus patio including music and games. At 5:00 p.m., riders may join the City of Scottsdale’s evening guided bike ride around quaint Old Town Scottsdale. Pedego owners are invited to attend the Pedego Palooza Scottsdale for free with an advance reservation. Guests may purchase tickets at $25 per person. To reserve a Pedego electric bike rental for the day, please contact Pedego Scottsdale at (480) 994-4447. Bikes are available on a first-come, first-serve basis and may also be available at Pedego McDowell Mountain, 480-473-3346, and Pedego Glendale, 623-233-4399. Pedego Scottsdale offers the region’s finest selection of Pedego electric bikes for sales, tours and rentals. Located at 6945 E. Fifth Ave, Scottsdale, AZ 85251, Pedego Scottsdale is open daily from 10:00 a.m.—5:00 p.m. Customized tours are available upon request. The staff looks forward to delighting visitors, beginning with free test rides. Please call the store at 480-994-4447 or email us at [email protected] for more information on rentals, tours or purchases. 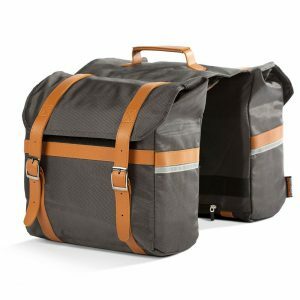 For photos and news, visit our website at www.PedegoScottsdale.com. 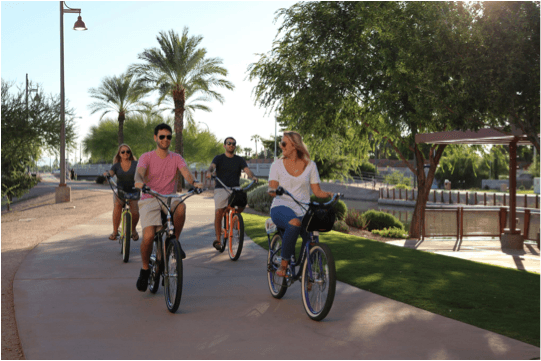 Pedego McDowell Mountain is the premier Pedego Electric Bikes dealer in North Scottsdale, offering a large section of bike sales, rentals, self-guided and group tours, accessories and service. Complimentary test rides are available. Open daily from 10:00 a.m. to 5:00 p.m., Pedego McDowell Mountain is located at 17060 N. Thompson Peak Pkwy #120, Scottsdale. For more information on Pedego McDowell Mountain, email us at [email protected] or call 480-4PEDEGO (480-473-3346). Visit our website at www.PedegoMM.com. 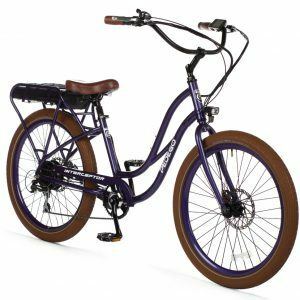 Pedego Glendale is the region’s premier dealer in Pedego Electric Bikes, offering a large selection of Pedego electric bikes sales, rentals, accessories and service. Free test rides are available as well as rentals and sales of Pedego electric bikes. Store hours are Tuesday through Sunday, 10 a.m. to 5 p.m., and Monday by appointment only. Located at 5940 W. Union Hills Dr., Suite B140, Glendale, AZ 85308, Pedego Glendale is near the Skunk Creek Trail, a scenic desert bike path with interpretive signs. To learn more and reserve a test ride, call (623) 233-4399 or email [email protected]. Follow us on Facebook and visit our website at www.PedegoGlendale.com.